"Trust in the Lord with all thine heart," the scriptures invite us (Proverbs 3:5), but how do we learn to do that? In a world of uncertainty and turmoil, where by His own divine plan we walk by faith rather than sight, how can we come to rely wholly on God's love and purposes for us? Rejoice! His Promises Are Sure is filled with insights that inspire and motivate us to seek greater spirituality and trust in the Lord. With personal stories, scriptures, and warm reassurances, author Ardeth Greene Kapp gently reminds us of our eternal potential and of the covenants we have made that will help us achieve it. "There is no question," writes Sister Kapp, "not only can he bless us, love us, forgive us, and heal us, but he wants to." And when things are hardest, and the afflictions of mortality surround us, she offers comfort in the perspective that "this life experience is designed for our growth and progress. Our trials will not be more than we can handle, but they cannot be less if we are to fill the measure of our creation." She goes on to testify that "if we are devotedly intent on returning home, we will be guided in every major decision we have to make throughout our lives— and we will enjoy the journey. . . . The lessons we were taught in the premortal existence included the plan for our salvation. The small promptings or inklings of memory we carry into this life are like a lighthouse in the harbor that beckons us home through stormy seas." Our Father in Heaven's plan is the "great plan of happiness." 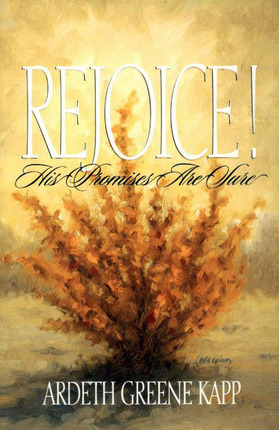 As we learn to trust in him and try to do his will, we too will rejoice, for truly, his promises are sure!